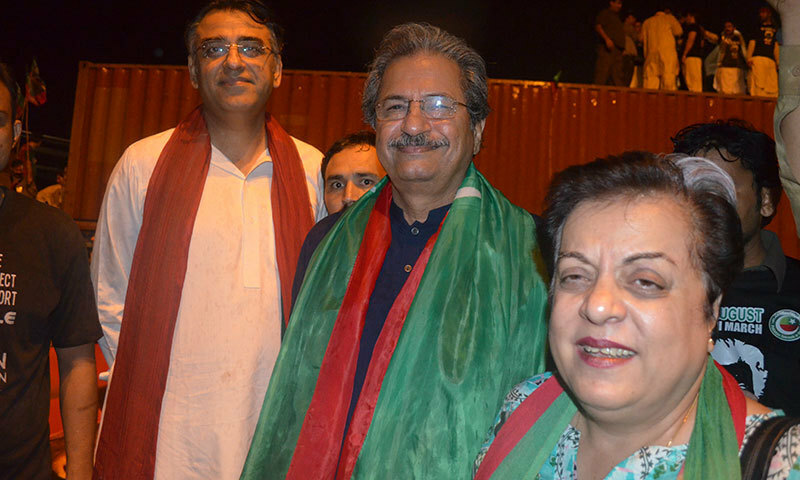 ISLAMABAD: An anti-terrorism court (ATC) on Wednesday granted bail to Pakistan Tehreek-e-Insaf (PTI) leaders Shireen Mazari, Arif Alvi and Asad Umar in cases of terrorism after the three leaders approached the court to get bail before arrest. The ATC was hearing cases related to the 2014 attack that took place during the party’s protest sit-in in the federal capital against the three leaders as well as PTI chief Imran Khan and Pakistan Awami Tehreek chief Tahirul Qadri. Mazari, Umar and Alvi are among at least 28 others that have been nominated in cases regarding attacks on Parliament House, Pakistan Television (PTV) building and former senior superintendent of police Asmatullah Junejo during the anti-government protests in 2014. The suspects — Asad Umer, Shireen Mazari, and Arif Alvi — surrendered before the court after a passage of three years. The suspects appeared for the first time in the case before the court for their pre-arrest bail. They were ordered to pay Rs100,000 in surety bonds to secure their bail. The leaders, however, requested the court to accept their bail sum in cash instead of bonds which was accepted by ATC judge Shahrukh Arjumand who was hearing the case. The ATC, however, declined the leaders’ demand to reschedule the next hearing — to be held on January 23 — since an accountability court will hear an ongoing corruption reference against former premier Nawaz Sharif on the same date. Earlier, the ATC had accepted Imran Khan’s bail petitions in all 2014 protest sit-in cases. ATC judge Sharukh Arjumand had earlier heard the concluding arguments of Imran’s legal counsel Babar Awan and prosecutor Shaqat Chaudhry on four cases registered against him for allegedly propagating violence during PTI’s 2014 sit-in in Islamabad. Outside the courtroom, Mazari exchanged heated words with the security staff for refusing to allow her car entry into the judicial complex. “Nawaz Sharif is allowed in court premises with a motorcade. Why is he allowed to enter the judicial complex but not us?” she asked. Talking to the media outside the court, Alvi rejected the notion that PTI was forming an alliance with the Pakistan People’s Party (PPP), saying that PTI workers would never respond to PPP Co-chairman Asif Zardari’s “call for corruption”. Explaining the reason behind joining Pakistan Awami Tehreek’s (PAT) protest — that will also be joined by the PPP — Alvi said that his party was only joining the protest to demand justice for the 2014 Model Town killings. He further clarified that Zardari and PTI chief Imran Khan will attend the protests at different times. On January 8, Dr Tahirul Qadri had announced to launch a protest movement against the Punjab government for failing to bring the culprits of the Model Town killings to book. Mainstream opposition parties, including the PTI ans PPP, have announced their support for the movement for justice to the victims of the Model Town incident. Imran and Zardari have repeatedly criticised each other’s parties’ governance and have rejected any chance of an alliance between their parties. In 2014, Khan and Tahirul Qadri staged a major rally in Islamabad against alleged rigging in the 2013 election and the Model Town tragedy, which had seen as many as 14 people killed and 100 others injured when police attacked Qadri’s residence during an ‘anti-encroachment’ operation. Khan had threatened to shut down the entire country in what was perceived as a bid to topple the government. The protest had continued for a record 104 days. On Sept 1, 2014, while the sit-in was still ongoing, SSP Junejo and five other police officers had been beaten up by protesters on Constitution Avenue as they stormed the PTV headquarters and the precincts of the parliament. Hundreds of PTI and PAT supporters led by their leaders had briefly seized the state broadcaster on Sept 1, 2014, at a time when the country was under intense political crisis. The protesters had disrupted the transmission of PTV news channel and PTV World for a short period of time. The buildings were later cleared by personnel of the Pakistan Army. The case was registered against Khan, Qadri, and others for torturing SSP Junejo and the other police officers. Both leaders were declared proclaimed offenders and arrest warrants were issued against them. The ATC had declared Khan a proclaimed offender and issued non-bailable warrants for his arrest in November 2015. In November 2017, the PTI chief had finally surrendered before the ATC in four cases regarding the 2014 sit-ins after the court ordered confiscation of his movable and immovable assets. After the surrender, the court had withdrawn his arrest warrants and granted pre-arrest interim bail to the PTI chief.